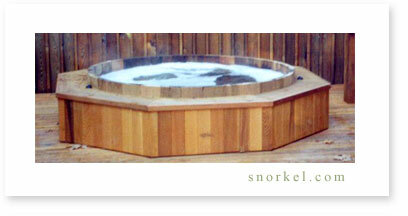 MOST of our customers choose our woodstoves to heat their Snorkel® Hot Tubs. If you prefer the convenience of gas or electric heat, order your hot tub with our Power Pak® gas or electric heating systems. All our Power Pak® systems are 100% integrated to give you fingertip control over water temperature, hydrotherapy jets, and programmable water filtration/circulation cycles. Your Power Pak® comes fully assembled, wired, plumbed, and mounted on a fiberglass skid (excluding the gas heater itself in gas systems). For your safety, not only is each component UL listed; the Power Pak® as a unit is also UL listed. Whichever you choose, THE CONNECTIONS TO YOUR GAS AND/OR ELECTRICAL SUPPLY SHOULD BE MADE ONLY BY A QUALIFIED GAS SERVICEMAN/ELECTRICIAN. We offer five sizes of gas/propane heaters above our standard 100,000 BTU heater — see chart below. The larger units heat more quickly and efficiently than the smaller one. The incremental purchase cost per BTU is relatively low and, because they heat water faster, there is less time for heating loss during the heating period. Larger BTU units may require modifications to your gas meter and/or piping. Your gas company will be happy (no surprise) to make any modifications you may need for your new heater usually at minimal or no cost. Call us for more information. Our electric Power Paks® come ready to install. However, we strongly suggest you consult your electrician to plan the electrical connection requirements before purchasing your electric heat Power Pak® system. Only a licensed electrician is qualified to decide if your electrical panel is adequate and to ensure that GFCI (safety) requirements are met. What if your electrician tells you electrical panel capacity is a problem? 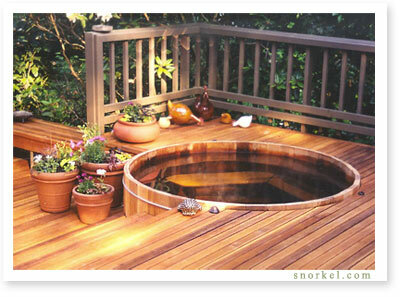 Our smaller, 6 kW heater may be the answer, especially for smaller tubs. Choosing an Power Pak®? Please give us a call. Choosing and installing an Power Pak® isn’t rocket science but thorough planning is key. There are several important considerations we need to discuss with you to make sure you get the appropriate system that is best suited to your needs. Give us a call: a few minutes on the phone will help make your installation seamless. 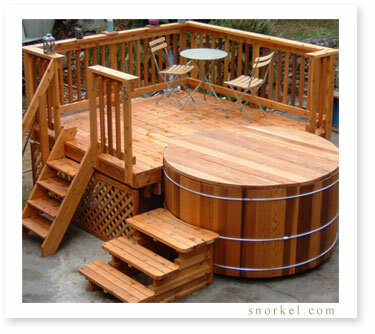 Many hot tub owners who choose gas or electric Power Pak® systems integrate their tubs into a deck for ease of entry, overall aesthetics, and to conceal the external plumbing components of the jet system. The Power Pak® itself is weatherproof and can safely be left in the open or installed behind shrubbery for cosmetic purposes. If enclosed, gas Power Pak® Paks require venting to the outdoors with manufacturers’ hoods.